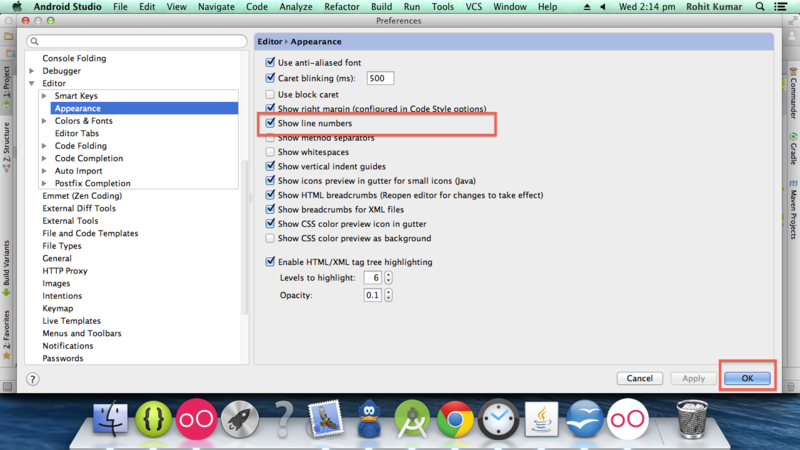 How can I permanently enable line numbers in IntelliJ IDEA? 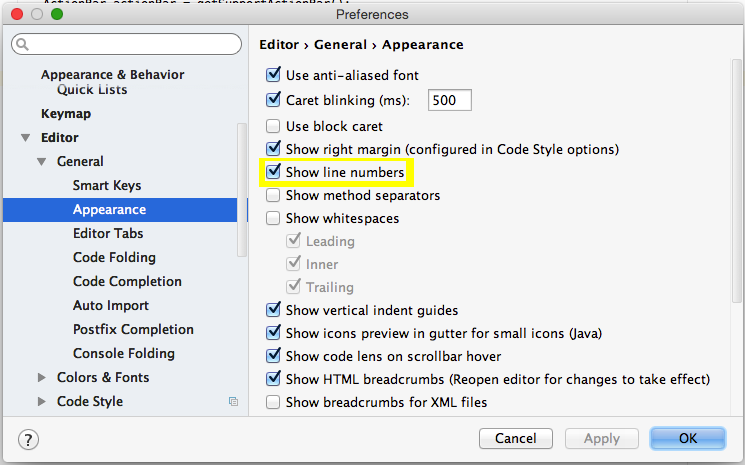 From IntelliJ 8.1.2 onwards, this option is in File | Settings1. 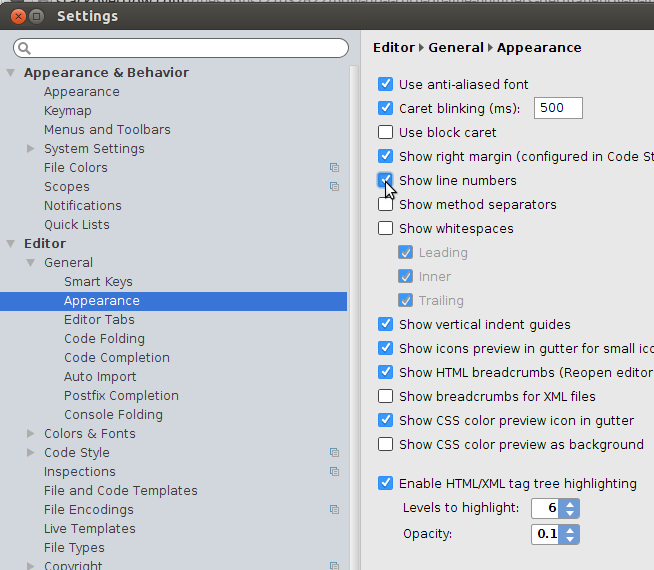 Within the IDE Settings section of that dialog, you'll find it under Editor | Appearance. 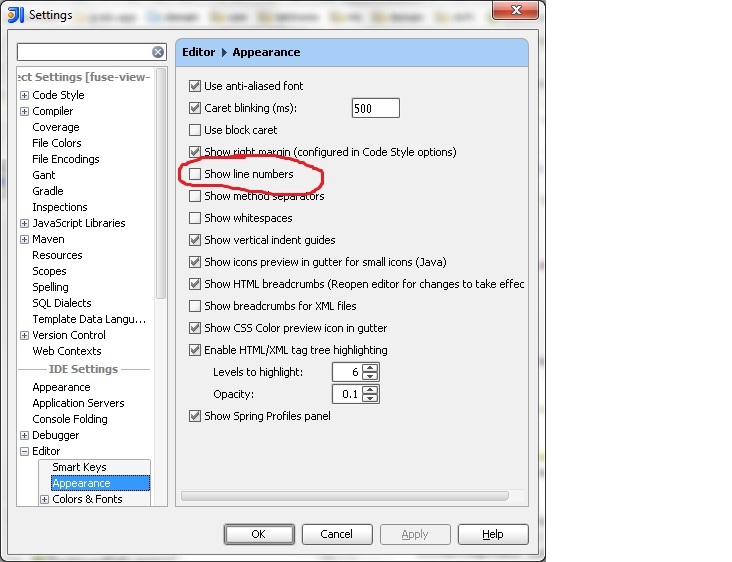 The option shows in the menu and press enter to enable/disable. Simply right click on the place where the line-numbers should be, and there you'll see a small menu. 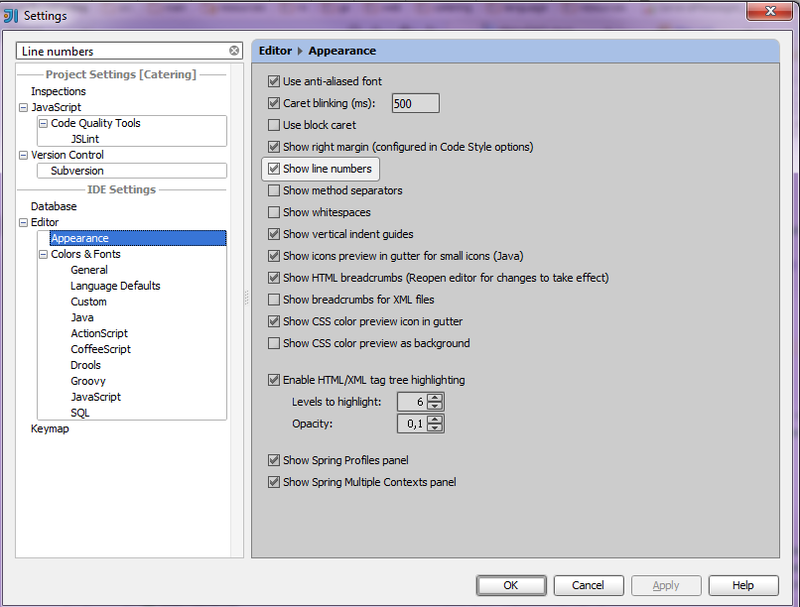 then, mark the "Show Line Numbers" option. Please note that this only works on a per-file basis, however. Enjoy. 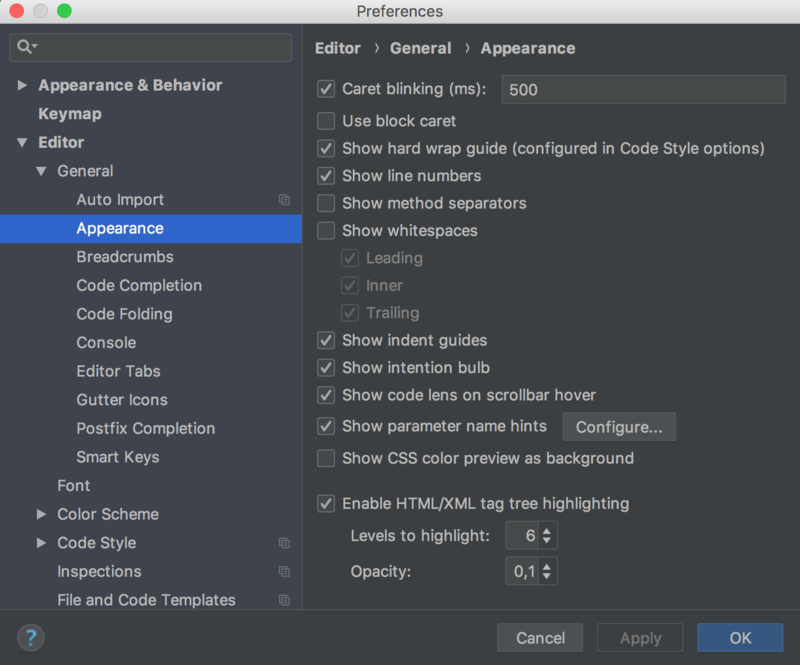 In Intellij 13 the layout has changed, the Settings button can only be found in File -> Settings and not in the toolbars, and from there you follow the same steps: Editor -> Appearance -> Show line numbers, or search for Line numbers in the Settings search input. 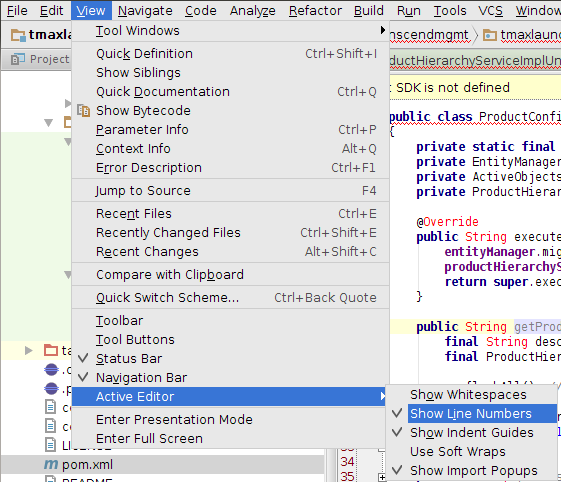 Second way: Right click on the small area between the project's structure and the active editor (that is, the one that you can set breakpoints) -> Show Line Numbers. and tick Show line numbers check box. 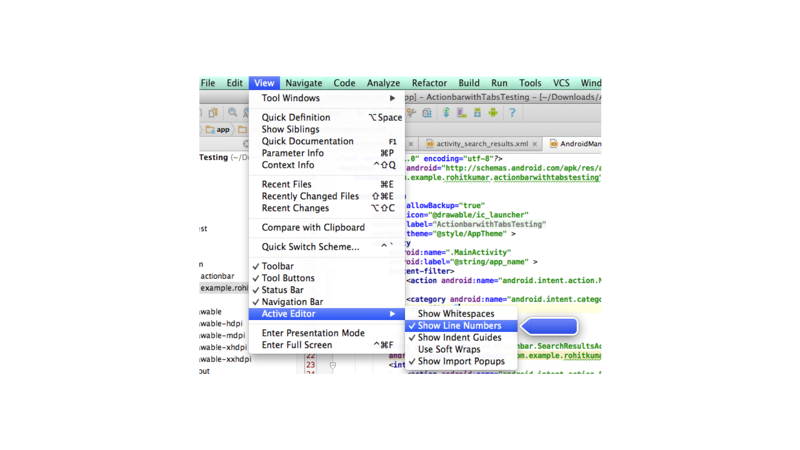 Ok in intelliJ 14 Ultimate using the Mac version this is it. Go to Android Studio => Preferences => Editor => General => Appearance => set Checked "Show line numbers"
I just hit this with IdeaVim plugin installed, where even if I set Show Line Numbers, it continued to revert to hiding them. 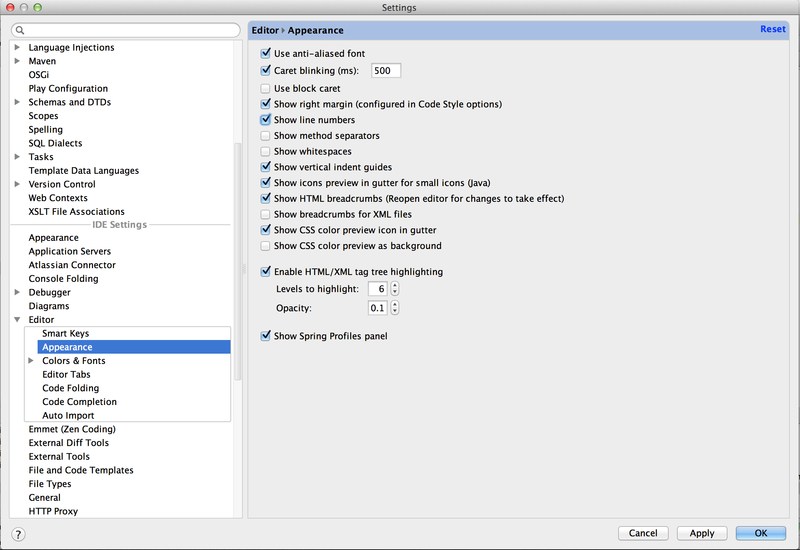 2nd way Go to Android Studio => Preferences => Editor=> Appearance => set Checked "Show Line Numbers"
and within that is the "Settings" dialog shown by the Windows Intellij. 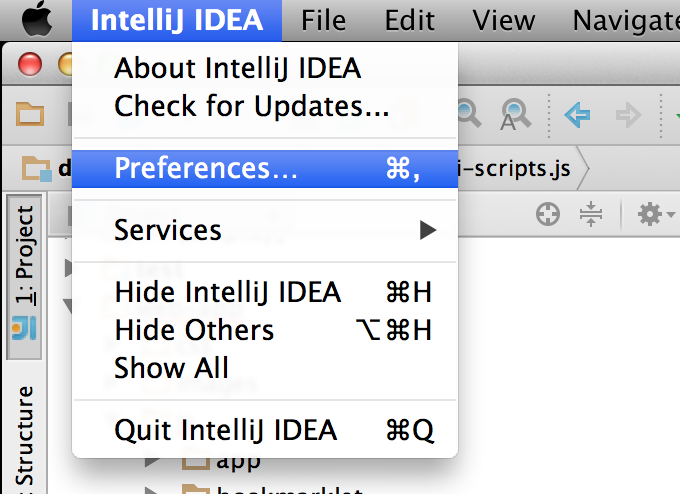 In IntelliJ 14 it has moved again somewhat down the menu. I add this response for IntelliJ IDEA 2018.2 - Ultimate. 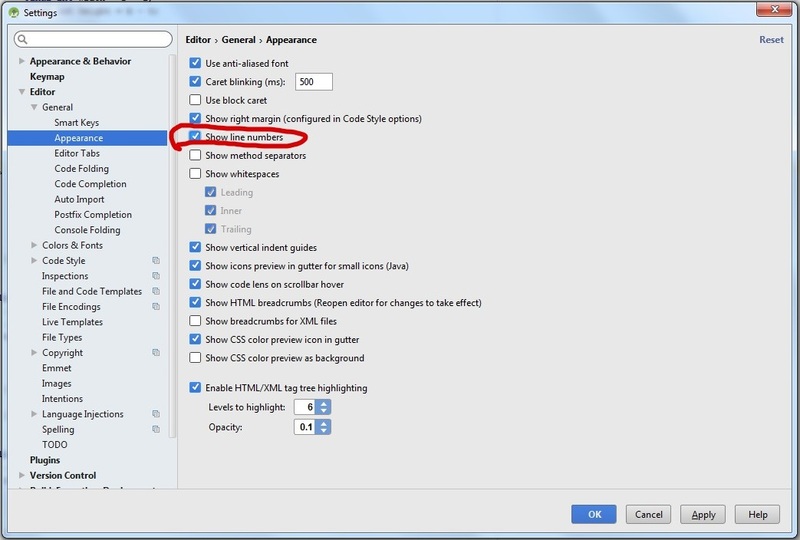 These three methods exist since the last 4 versions of Intellij and I think they remain valid for a long time. 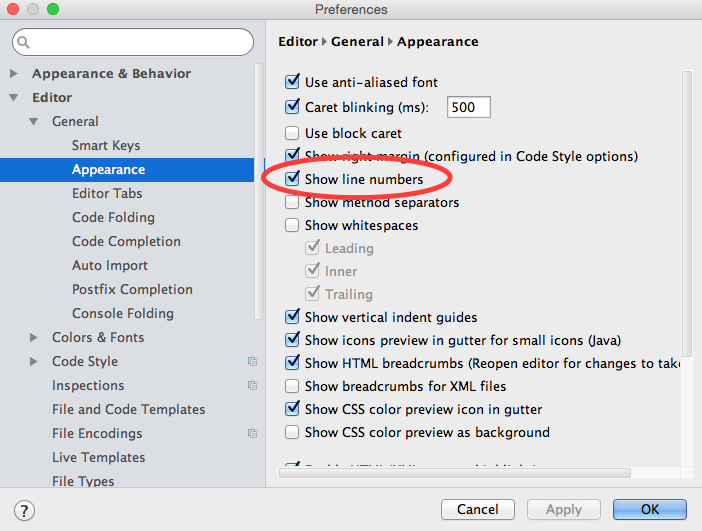 How do I turn on line numbers permanently in IntelliJ 14? 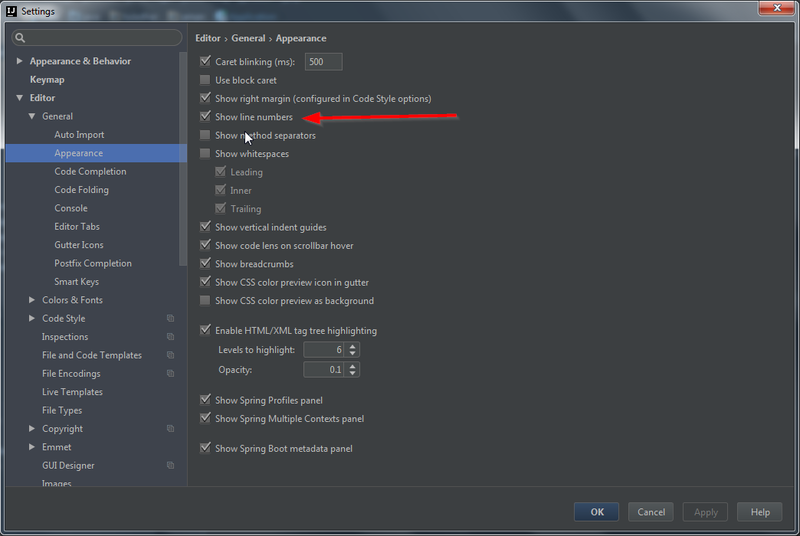 How do I set up IntelliJ IDEA for Android applications? 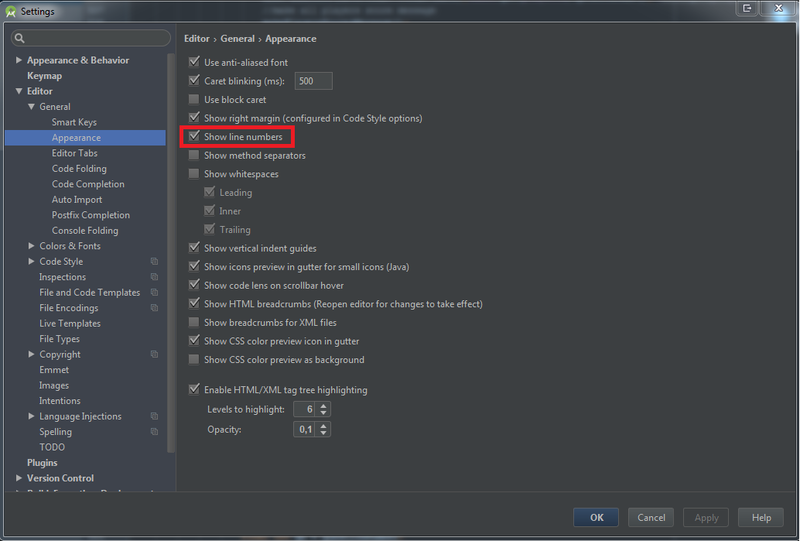 How to make IntelliJ IDEA insert a new line at every end of file?